I pull up hard. Liz thumps into my back panniers rocking us forward. ‘What am I supposed to do now?’ I ask. Stretched out in front of us is a carpet of little yellow brown peeks running the length and width of the road for about 200m. This is not a wide road, with the Mekong to the left and front walls to the right there is no go-round option. ‘Go over it?’ Liz ventures. We hover uncertainly. A creaking clatter of school girls giggle up behind us. They loop past us and career boldly into the rice carpet. Their bulging bald tyres slip and slide a grove through the shifting surface; the requisite pillion passenger extending their legs to offer stabilising support. ‘Best do it then’ I sigh as we kick off. We love a good “industry” road. An area or road dedicated to one particular industrial thing; we loved the banana road in China, the rubber road in India, the tobacco road in Cambodia and now the rice road in Vietnam. Though, to be fair, this whole route, from Northern Vietnam to the Mekong Delta could be called the rice road. Rice is everything and everywhere. 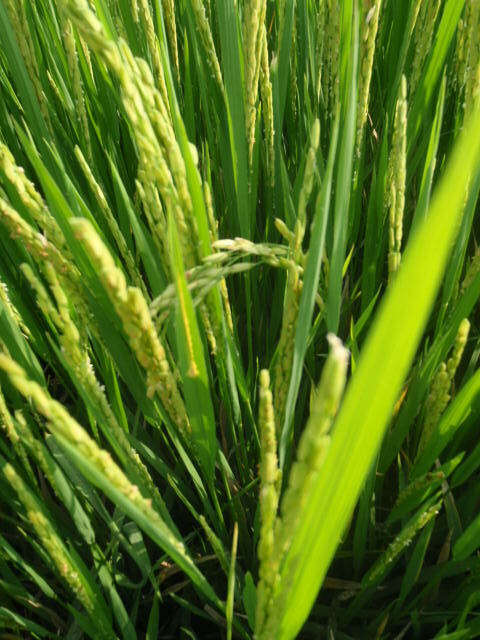 Rice is the Mekong region. In the wet north we saw impossibly greener than green rice nurseries where the shoots grow snuggled together in dense protected patches. We cycled days of farmers planting the shoots into the wet paddies; the rhythm of the planting stoop, the labourers back breaking daily grind, threading a beat through our days. We cycled as the shoots grew and we were cooled by the breeze as it skimmed the paddies pulling a welcome chill into the heavy hot air. We cycled as the crops became full in their pregnancies and began to bend low in the fields. 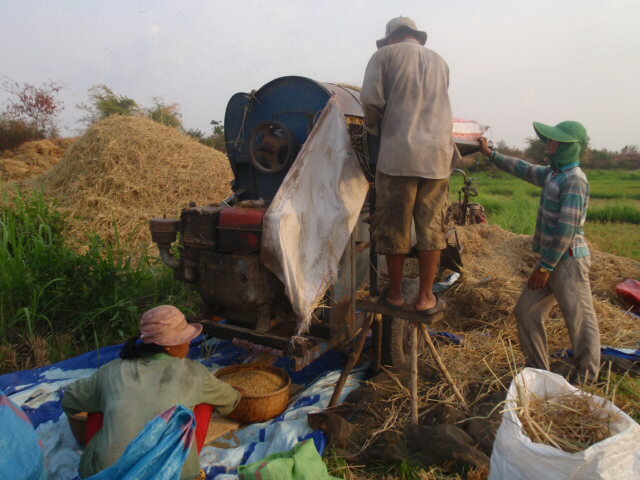 And we cycled as they were harvested; days upon days where the whir of machine threshers trumpeted the farmers success. And so, today, we cycled into the Mekong Delta proper and on to a 65km stretch of road between Long Xuyen and Rach Gia, and thus it was harvest time. Long flat bottomed barges course along the river, their hulls pushed precariously low by the weight of sack-full upon sack-full of threshed rice. Hives of men and women methodically unload the sacks and pour them onto huge nets that lie on any open, flat surface, the road being ideal. 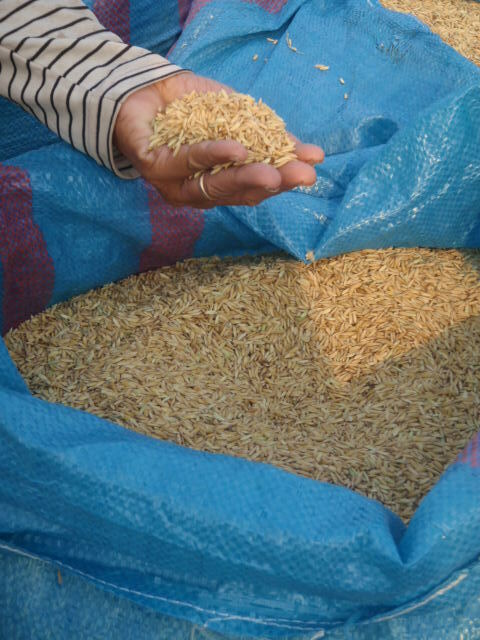 The rice is then combed into small peaks where upon the sun sets to work drying it out. And so it was on our road and so it must be on any number of winding roads in the Mekong Delta; it is aptly named the rice bowl of Vietnam. 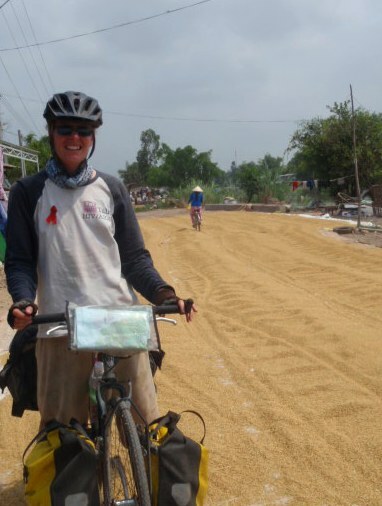 As we pushed off onto the drying rice, we made impossible efforts to cycle as lightly as we could. Only to be over taken by a truck! How strong is unhusked, uncooked rice anyway!! !